Many content marketers find the promise of intelligent content intriguing, but they have a hard time finding examples that showcase the value of this approach in marketing. To help address this need, Scott Abel and I recently interviewed James Mathewson, the Global Program Director for Search and Structured Content Strategy at IBM, about the role of intelligent content in marketing. In this interview, summarized below, James describes the way a team of content creators and technology experts have created a structured intelligent-content strategy to make IBM’s marketing content findable, usable, reusable, responsive, and personalized. Read on to learn what has worked at IBM and how adopting intelligent content has opened new opportunities for creating, delivering, and measuring quality content. Why does a company like IBM need intelligent content? James: IBM needs intelligent content to avoid content shock. Without intelligent content, we push too much at people. We don’t give them what they want when they need it. Our customers and prospective customers have had trouble finding all the great content we build. With the help of intelligent content, we are evolving away from page-bound information to a new model that serves our audiences better. The new marketing model resembles the structured, modular approach that IBM has taken for a while in technical documentation. What can intelligent content enable IBM to do that was difficult or impossible before? James: We have a variety of detailed personas representing the types of people we want our content to attract. Some of them approve purchases, some of them influence purchases, and so on. Based on those personas, we determine what information people need at each stage of the decision-making or buying process. For every persona, there might be 12 pieces of content. Then we build that content and serve it up in the places where those people hang out: web, mobile, social. That content has to be adaptive, device agnostic, and browser agnostic. We build a content model for each persona type. We build a content-production environment to help our content creators build the right content for the right audiences. Ideally, we build an environment that allows use of modular pieces of content to be repurposed in meaningful ways, often automatically. Then we can pool our resources to create repeatable, useful content. We couldn’t do all that without a lot of intelligence, including automation. How did you sell the value of intelligent content in marketing to IBM marketing management? James: Like most marketing organizations, ours has a mix of executives trained in various approaches. Traditionally, marketing professionals everywhere were taught to think in terms of highly visual, iconic branding. Content was often seen as a vehicle for advertising. For decades, that was the comfort zone in the marketing world. The data-driven intelligent-content approach requires a transformation in mindset – in fact, a transformation in culture. This transformation is the biggest challenge for many marketing departments. It’s bigger than processes or tools or hiring the right staff to do the work. I have seen people go through this transformation at IBM. They come to see the business value of content that’s more about informing than selling. Content that’s driven by audience needs – and we’re talking about an audience that’s in self-service mode. People who want to understand things for themselves in their own time on their own terms in their own way. We’re serving a generation that looks to Wikipedia for answers. We realized that IBM needed to be involved in contributing content in that space or we would miss business opportunities. This kind of transformation isn’t always easy. Marketing executives think in terms of ROI. To convince them of the value of data-driven, intelligent content, we did two main things. First, we gathered and shared business-related data – not page views – data that showed how our content was generating leads or revenue. And we had some compelling data. We measured our share of the conversation in social channels. We measured how much of our traffic became qualified leads. We measured the kind of interactions we were seeing. We demonstrated that our content was leading to a bigger, stronger, richer customer list. We showed the data to executives in a visual way. And they got it. I said we did two main things. The second was that we persisted. Cultures don’t transform overnight. Executives are pragmatic. They want to make sure that an approach works for the business. We kept measuring, kept showing improvement. Some people might be convinced after a month, some after a year. We kept telling the story in a consistent framework. Intelligent content usually starts in technical communication departments. To what extent do you think intelligent content applies to other areas of an organization? James: If marketing is doing it right, it’s helping sales. Sales-enablement content could benefit from this approach as well. Sales should think more of how it builds its client lists with content-driven enticements. The sales cycle does not end when you sell the product or service. The relationship with customers is a continuous thing. Everything we create is marketing, whether we realize it or not. Some 70% of IBM buyers consult our technical documentation during the purchasing cycle. All the content along the customer journey needs to be aligned. So we can’t think in terms of presale vs. postsale information. We have to create content to share and reuse across the departments: technical support, documentation, marketing, and so on. Ideally, intelligent content helps products sell themselves. It up-sells by helping people discover new, related products and services they might not have known about before. In a self-service world, this is what people expect. IBM has focused on spreading the use of DITA XML across the company. Most recently, the company has worked to learn how XML could be used in the marketing arena. Can you talk briefly about that effort? James: DITA – Darwin Information Typing Architecture* – got its start at IBM over a decade ago. Although DITA isn’t the only way to make content intelligent, it has worked well for technical documentation. We’re now trying it out in marketing. DITA gives us a way to create content components that work intelligently instead of creating monolithic pieces, for example, case studies created in InDesign and output to PDF. That kind of content has to be served up whole. It can’t respond to the needs of an individual at a given time. Besides, nobody shares a PDF. With DITA, we can define and organize our content according to the type of information in each component. We can use XML to identify this part as a short description and that part as a lead paragraph, a title, a subhead, a step in a procedure. All these labeled parts get put into a database. Then we can use them in various combinations and output them in various ways: here’s the phone version, the tablet version, the PC version, the social version, the HTML5 version, the eBook. This approach helps us build adaptive content and tag it for measurement. *Editor’s note: Here are a couple definitions of DITA from industry experts, who are also speaking at the Intelligent Content Conference in March along with James. What marketing-related information types did you discover when auditing your content? James: Case studies are a very common information type for us. White papers, too. We create various versions of a white paper: a light version, a heavy version, audience-specific versions. And we may deliver them in various ways: PDF output, HTML 5 output, smartphone output. Other information types are data sheets (product specs), product documentation, infographics, videos, demonstrations, slide decks, and podcasts. Whatever the information type, we aim to build in intelligence so that we can adapt and change what customers see. For example, an infographic may be more than a monolithic JPG; it might have subcomponents or metadata that can be used in various ways. A podcast might have a text script that can be read and reused. A white paper might be associated with a pull-quote that gets used independently. A video might be part of a DITA specification that helps systems embed it in ways that make it possible for us to get more meaningful measurements while making it more meaningful for people watching it. What reuse potential have you uncovered? Can you give us a typical example? James: All our information types use the product’s short description, for example. Ideally, we create the short description once and reuse it in hundreds of places. And that’s just in the source language. The efficiencies increase astronomically when you factor in all the translations. How does Watson play a role in your efforts at IBM? James: Watson is the artificially intelligent computer system developed by IBM. We haven’t plugged Watson in yet for our purposes. Maybe by the end of 2015. We expect Watson’s big-data analyses to give us insight into our clients’ natural language patterns – the words they use most in search queries, for example, or the phrases they use most on Twitter and Facebook. Right now we have analysts doing this work. And we won’t lose the need for people to do it. We hope to use Watson’s results as extra help to guide our authors so that they can create content that’s more relevant to our audiences. 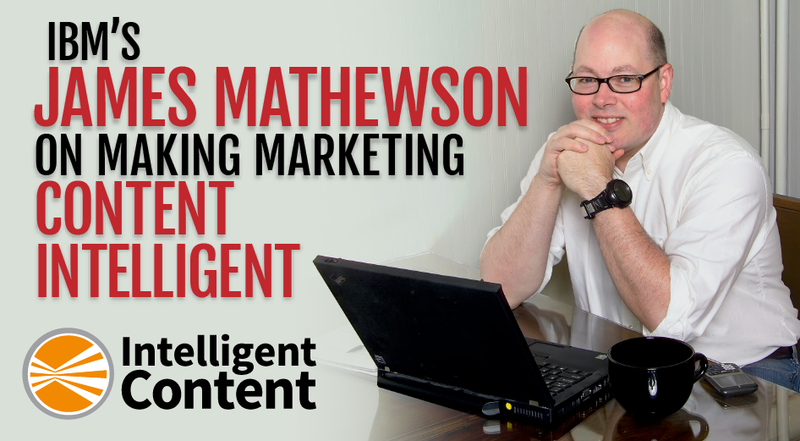 What else might marketers need to know about intelligent content? James: Marketers need to know that they can do this stuff. There’s a quip going around, “We tried doing intelligent content, but we decided to do easier things, like building self-driving cars.” Yes, it’s challenging work. But don’t let that scare you away. Marketers need to know that they don’t have to work for a big company to do the kinds of things IBM is doing. There are all kinds of tools that can do some of what Watson does. Even small companies can get metrics from a variety of subscription-based SaaS tools at a relatively low rate. Anyone can do keyword research, even with a small paid-search budget, to get insights into various audiences. Paid search is the highest-ROI advertising model out there: You earn money and collect data at the same time. This data helps you understand what content to build. Do the basics right. Don’t spray and pray. Listen to your audiences. Build only the content they need when they need it. If you transform your environment in that way, you’re farther along than most marketing organizations. At IBM, James engineers tools to help content producers create, curate, and measure relevant digital client experiences. These tools use semantic and contextual data to advise marketing, communications, and sales-enablement professionals on what content to create and how to create it in findable, reusable, and shareable chunks. 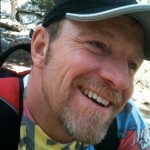 James is the lead author of the book Audience, Relevance, and Search: Targeting Web Audiences with Relevant Content. His new book, Outside-In Marketing: Using Big Data to Guide Your Content Marketing, co-authored with Mike Moran, comes out from IBM Press in June 2015. James lives in Beacon, New York, and works in IBM’s Watson Marketing Experience Lab in New York City. Scott Abel (@scottabel), The Content Wrangler, is speaking at Intelligent Content Conference 2015 on Intelligent Content in the Experience Age. He is an internationally recognized content-marketing strategist and social-networking choreographer whose strengths lie in helping global organizations improve the way they author, maintain, and deliver information.